The première of Tosca was celebrated with standing ovations and bravo-shouting [...] The Dutchman Dijkema has a feeling for the essential. [...] This production is exceptionally beautiful, the set design grandiose [...] Summa summarum: This (bloody, sensual) opera is a romantic paramount achievement. Go on like this and more of it! 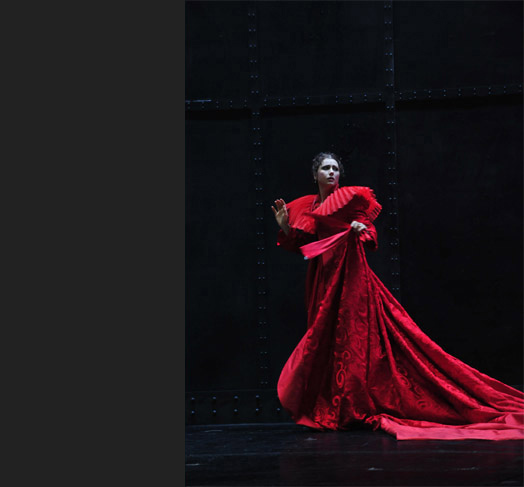 Michiel Dijkemas production of Tosca indulges the desire for music theatre of overwhelming emotions [...] for this opera on love, politics, tyranny and desire of freedom he finds visually stunning analogies. For example an enormous wall with 1000 prayer candles, which inescapably become shorter [...] or the monumental organ, which concludes the first act, on which the chorus is placed, capped and gowned as church dignitary [...] Finally the heavenly firing squad [...] Also the production team is basking in undivided jubilation. [...] convincing protagonists. Between them develop scenes full of tension over and over again. [...] Thousand candles and a over-life-sized Madonna-statue mark the church, a pompous desk with twinkling crystal glassware the retreat of Scarpia, a box-shaped bunker the torture chamber. [...] when in the last act the jailer comes out of the box, with a big bushy beard, a pipe and lots of theatre haze and meaningfully paces up and down, while shaking his head thoughtfully, it can’t be missed, that stage director and set designer Michiel Dijkema is playing with conventions. He is playing with the paradox of music theatre. The firing squad, which Tosca believes to bring her love freedom and not death, are rising angels with enormous wings. [...] When she runs away from the henchmen, the box in front of her opens and is lifted to the height of the stage opening. Tosca doesn’t jump, she falls down backwards on the stage floor. Curtain, thunderous applause. The executed Cavaradossi stands up, takes a bow, goes to the puppet of the fallen Tosca and she also stands up! Bow, applause. Long live opera, long live theatre. In this production of Michiel Dijkema, who is also responsible for the set design, not only vocal excellence can be heard, but also touching and enthralling theatre is taking place. [...] an exciting opera evening, which was received with sustained applause. [...] In the second act an iron wall comes down, thus creating an eerie room, from which one isn’t able to escape. The chief of police is distressing Tosca with a glowing burning iron. [...] The revolving stage continues to create new locations. They are mainly dominated by a sea of buring candles. And the tableau of clerical power in the church Sant’ Andrea della Valle, which is rising from the under-stage area, is pompous and breathtaking. [...] Also the vocal quality and the acting in this new Tosca production are a sheer joy! [...] A few stage elements like the long wall with church candles, a Madonna-statue or Scarpia’s writing desk unmistakably create a reduced but illusionistic Tosca-stage. [...] The Te Deum, the final scene of the first act, creates a surprise, after Scarpia added fuel to Tosca’s jealousy towards her lover Cavaradossi and the intrigue takes its course: From the under-stage area rises an enormous church organ. The participants of the procession are placed between the organ pipes – a still life of cardinals and other clerical potentates. [...] Only in the third act Dijkema breaks with the conventions which he introduced before: Tosca informs Cavaradossi that his execution will only be a fake execution and that they will leave Rome with a letter of safe-conduct. Together, on an ottoman, they airily play through their life in freedom, far from social constraints and repression, and for a moment the production unfolds a fragile, utopian monument. [...] At the end there is loud and prolonged applause. Dijkema is no stranger to the Opera Leipzig: Two years ago he landed a remarkable success with his staging of Rossini’s Il Turco in Italia: Around his by now legendary libretto machine Dijkema created a turbulent play using different historical theatre forms with different layers and intentional friction between fiction and reality, which he combined to an entity as funny as intelligent. [...] Exactly this is the point of origin for stage director and set designer Michiel Dijkema. The atmosphere, which the sounds create, are enhanced by the set design. The element fire for example plays an important role. Hundreds of burning candles are placed on the stage and make during the first act the church perceptible by the senses. Also because of the costume designs and the make-up the overall impression can be described best as impressive. Stage director Michiel Dijkema attaches a lot of importance to this liturgical aspect of Tosca. During the performance approximately 1000 candles illuminate the scenery, haze enhances the impression of a catholic church atmosphere. The Te Deum itself becomes the scenic culmination point of the evening, the whole chorus is raised up quasi as a living organ front. That’s impressive and also musically beneficial [...] the sets are congenially conceived. [...] It is obvious that Leipzig has been waiting for this production. [...] the house was full and the atmosphere excellent! The performance I attended was the 33rd since the première, and it seems that this production has great potential for being in the repertoire in Leipzig for a long time. Michiel Dijkema is both stage director and set designer, but he also works as an accompanist of singers. Maybe that’s why the show literally seemed to breathe. He staged many attractive scenes which perfectly fitted the spectacular set design. For example the Te Deum and the fascinating conclusion of the entire work with the fall of Tosca from the Castle of Angels. This is how you make world theatre!